« How Do You Make a Cat Food Pouch Bag? Casalinho’s Permaculture Design Course Announced! Jeroen and I are really excited to confirm the dates of the first official Permaculture Design Course to be held at Casalinho e Escabelado. 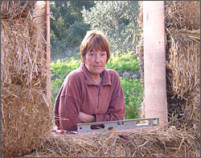 It will be held from the 10th to the 19th of June 2011 and be taught in English by Lesley Martin. We’ve had some interest already, particularly from volunteers in what is generally a very busy time of year for us, so please register early.